Whether served in a tortilla boat or atop nacho chips, this salad gets its spirit from the rich combination of Ranch dressing and picante sauce that dress its fresh ingredients. skinless, boneless chicken breast halves	 96 oz. 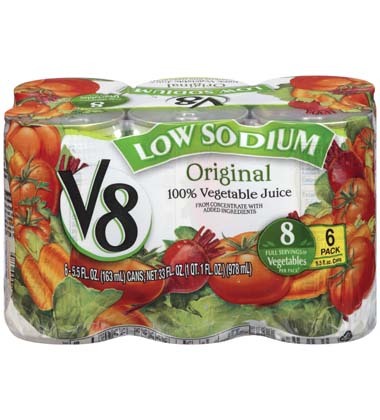 Low Sodium V8 Juice helps your patrons get 2 servings* of vegetables in every nutritious 8-ounce serving with 70 percent less sodium than regular V8 100% Vegetable juice. ** It’s also an excellent source of potassium which helps maintain fluid balance and normal heart rhythm. Diets containing foods that are a good source of potassium and low in sodium may reduce the risk of high blood pressure and stroke. 1. Place chicken breasts in full-size hotel pan and pour Picante Sauce over top. Toss to coat completely. Cover and refrigerate at least 2 hours before grilling. CCP: Refrigerate below 40°F at least 2 hours before using as directed. 3. In bowl whisk together Picante Sauce and ranch dressing until blended. Cover and refrigerate until ready to serve. CCP: Refrigerate below 40°F at least 2 hours before using as directed. tomato, diced	 1 1/2 qt. Cheddar cheese, shredded	 24 oz. 1 1/2 qt. 4. 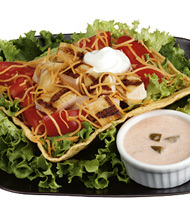 To Serve: Place 2 cups lettuce on chilled plate and top with 1/4 cup chopped tomatoes. Top with a 4-oz. scoop of grilled chicken chunks and sprinkle with 1/4 cup shredded cheese. Place 1 oz tortilla chips around perimeter of plate. Place 1 Tbsp. sour cream on top and serve with a 2-ounce ladle of Picante-ranch sauce in a souffle cup. Cheddar cheese	 24 oz. 1 1/2 qt.